It’s amazing to me how we can hang on to the things of the past. When I was pretty young my dad and my stepmother went to Spain as part of his sabbatical from the University. When they returned they told me of their amazing trip away and my stepmother showed me the pearls she got while visiting Mallorca. Something happened in that moment, like a seed that took root or a thorn lodged in my flesh. Either way, 12 year old Mona decided that she would one day travel to Spain and get a pearl of her own. Brian did some research on pearls and discovered that there is quite a range - from imitation to cultured and of course natural pearls found in the wild. He offered to scuba dive the waters of Mallorca to find me a pearl but I decided to hedge my bets and just buy one, if ever I got there. It took 40 years, but finally this summer we made it to Mallorca, Spain. It was the weirdest sensation finally being in the place I had longed to be for so long. As I walked up the cathedral steps I wondered if my dad was in awe, as I was, by the grandeur of the building made to praise and worship God. Did he stop and take it in or did he just walk by? As we walked the streets of the beautiful town of Palma it was clear that the thing to buy in this place was pearls. Little pearl shops were everywhere and Majorica Pearls (the brand name), we discovered, were inexpensive and not “real”. I didn’t care. I was not leaving this place without a pearl. We stopped at a little shop and I saw one that I quite liked. It was super inexpensive and I was pleased to have found something so quickly. Brian on the other hand was not impressed. “Let’s keep going, this way,” he said as he looked down at his Google maps app. “There is another place just up the road that you should check out first.” He directed me to a “proper” pearl store. 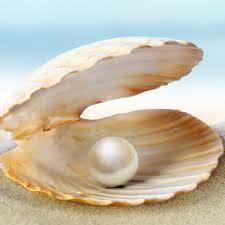 We looked in the showcase and our eyes both fell on the pearl I had always imagined and described. It was beautiful but it was more money than the one I had seen earlier. “I am okay with the other one,” I said to Brian. “Let go of the idea of a plastic pearl, Mona.” With that the sales person lifted the pearl out of the display and put it around my neck. It was perfect. So it is with our Heavenly Father. He is waiting for us to give up the cheap, imitation things in our lives so that he can give us beautiful treasures. Sometimes it is so hard to see what is just up the road but I do believe this one thing: when we are finally able to let go of “it” (maybe it’s a thing, or a unhealthy memory, habit, attitude, or relationship - whatever it is) - God will always give us something better in its place. Trust, because God is that good.